Valkyrie is feeling excessively introspective (you know, about the whole “I stole this body and life from Barbara Norris” thing) so she wanders the slums and saves a baby from a rat (that looks a lot like a cat). She takes the child and her mother, Elena, back to Dr. Strange’s house (where Val is living). Once she’s out, the Sons of the Serpent blow up the house Elena had been living in, spouting nationalistic white-pride slogans. Which is odd, because Elena and her baby are white. Oh, well. 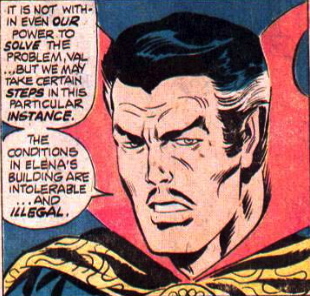 Yes, the Serpents and The Defenders both have something in common: They will brook no slumlords. Anyway, when both the groups are together in the same neighborhood, it’s a street-level battle of Defenders vs. Sons. This is also odd, because a team with Strange, Hulk, and Valkyrie have way too much power for a street fight. Chalk it up to Nighthawk being on the team, I guess. Yellowjacket joins the battle. He’s a waste of space. Not only does he get shot, but later he twists his ankle. This guy was an Avenger??? The Sons actually beat the team and kidnap them (except Hulk, who is too heavy for them to lift). This is dumb. Seriously. There’s no way a third-rate Hydra wannabe group could take down The Defenders. And if they could, they probably could figure out a way to lift him. 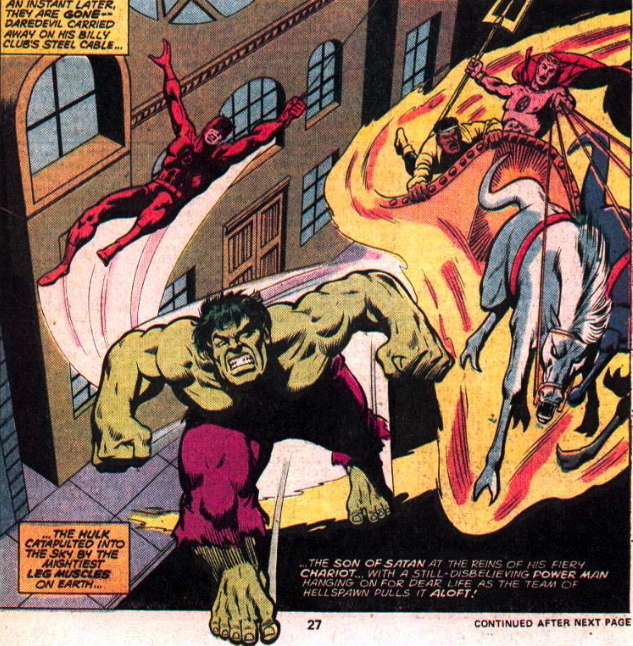 Anyway, Hulk and Clea get Daimon Hellstrom, Daredevil, and Luke Cage to help them rescue the team. And even this group is failing until nonpowered Jack Norriss (Barbara Norriss’ husband) arrives and saves the day. 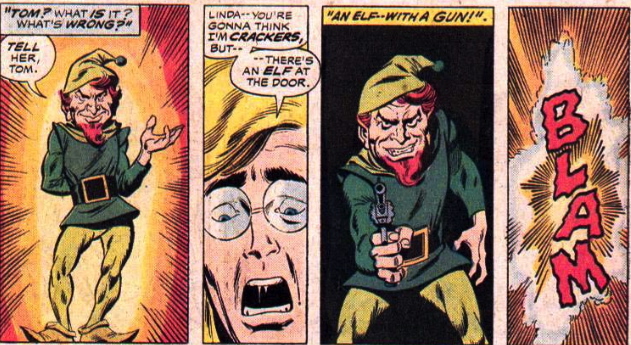 I love Steve Gerber, but there are some basic elements of this story that are ridiculous. I wish he’d given the Sons some kind of special power so it was more believable.